Sandwitch and Warlock Welcome You to our Website! Here on our website will find Victorian, Edwardian, Renaissance, and other kinds of Period fashion jewelry re-created by Scarlett Graywolf. You can also find quality vintage and new brass jewelry components and findings, glass and crystal beads, glass jewels and rhinestones in our Ebay store. 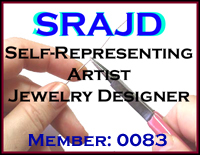 There are jewelry making tips and much more! You will find a lot of magic here! Want to get started making your own jewelry? Click this link and see our new video on YouTube! Click here if you wish to sign up for our newsletter!